Rónán Ó Snodaigh is a musician, poet and vocalist from Dublin, Ireland. He is the lead vocalist in the musical group Kíla. He has released four albums to date, Playdays, Tonnta Ró, Tip Toe and The Last Mile Home. He also worked with Mic Christopher on his album Skylarking and with breton based singer songwriter Dom Duff on the album Straed an Amann (Butter' Street).Rónán has composed music for nature documentaries 'Wild Journeys' and 'The Eagles Return'. 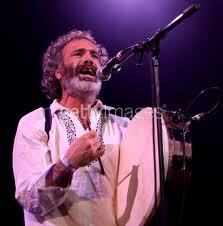 He also plays the Bodhrán, the Djembe, the Conga, the bongos and the guitar along with many other instruments.